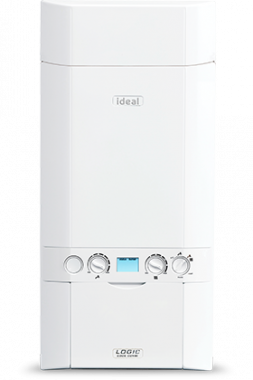 DISCONTINUED.If you live in a flat or a small semi-detached house and you're looking for an affordable energy efficient gas boiler the Ideal Logic Code Combi ES 26kW boiler should more than suffice. It's available in higher outputs 33kW and 38kW for larger houses with greater heating demand. Approved by the Energy Saving Trust this wall-mounted boiler supports level 4 Code for Sustainable Homes and delivers high DHW efficiency and DHW flow rates. Benefiting from good water heating efficiency it has a SEDBUK rating of 89%. The boiler features a stainless steel recuperator to recycle waste gas. To save time and energy the recuperator pre-heats cold water from the inlet to speed up hot water delivery. With built-in pipework it is easy to install and will fit inside most standard kitchen cabinets it measures 83x40x28cm. There's a control panel at the front of the boiler for easy access plus a digital display and diagnostic fault codes in cases of malfunction. For greater efficiency the hot water and central heating temperature can be set individually. An optional built in programmer is available. The Energy Savings Trust recommend this boiler.